For me, playing and experimenting are pretty much the same thing. As I play with one idea, I often come up with ideas for new directions. The nice thing about not being tied to a production schedule is having the time to follow those new ideas wherever they might lead. (I justify this by calling it “class development.”) My science background probably explains my need to make some kind of orderly sense from the results and my desire to share that understanding with other people. I achieved about a half-dozen distinct variations from a given cane without doing a lot of extra cutting and piecing. Beyond that, the effort became tedious. 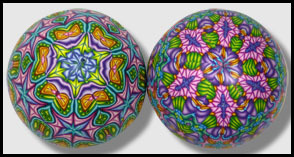 The differences were more obvious with the larger cane designs. 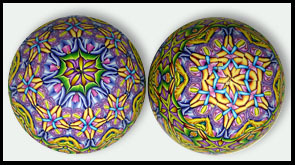 The two images below show the sides and tops of four eggs. Notice how markedly these “medium” eggs vary in shape! 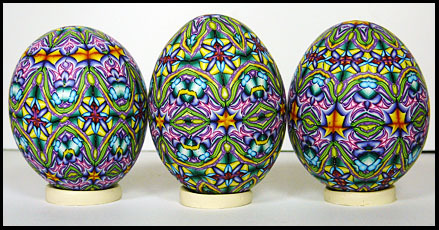 I’ve covered about 30 eggs now and I’ve learned that the results are the best when the slices are as thin as possible. (These are about 1 mm thick.) The thicker the slices, the more opportunity there is for distortion during their application. 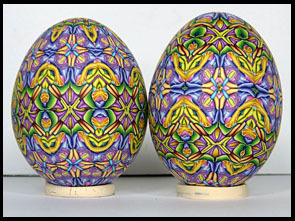 It also helps to place the slices between sheets of cardstock or paper for 15 minutes or so before applying them to the egg. This reduces their stickiness and makes them easier to handle. They can be applied directly on the shell and will adhere with light pressure. I use an index card rather than a blade to lift the slices from my work surface because it makes it easier to transfer the slices to the egg. If the slices stick to my fingers I dust their top surfaces with cornstarch before I lift them from my work surface. This entry was posted in Cane Slicer, Caning, Classes/Workshops, Kaleidoscopes, Sources of Inspiration and tagged Carol Simmons, Color, Color Mixing, Kaleidoscope Canes, polymer clay, Polymer Clay Classes, Polymer Clay Colorado, Polymer Clay Teachers, Polymer Clay Techniques, Polymer Clay Workshops. Bookmark the permalink. Incredible! I can’t wait to take your class in Oct! Thank you Beth. I’m looking forward to it too! Absolutely beautiful! 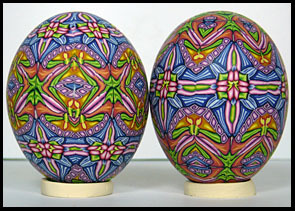 I love the colors, patterns and design on your eggs. They are just absolutely beautiful. Thank you. They aare lots of fun to do. Truly stunning! What intricate engineering to get everything to line up perfectly, especially when dealing with the size/shape variability. I’m in awe. Engineering really is a big part of it. Thanks! Carol, you are WAY too modest. Can’t wait to see you in Texas next year.